A ridge that follows the equator of Saturn's moon Iapetus gives it the appearance of a giant walnut. The ridge, photographed in 2004 by the Cassini spacecraft, is 100 kilometers (62 miles) wide and at times 20 kilometers (12 miles) high. (The peak of Mount Everest, by comparison, is 5.5 miles above sea level.) Scientists are debating how the ridge might have formed. SAN FRANCISCO ? A massive ridge nearly encircling Saturn'smoon Iapetus is likely the remains of a mini-moon destroyed by Iapetus' gravitylong ago, a new study suggests. This sub-moon probably formed after a giant object smashedinto Iapetus, and the blasted-off pieces coalesced, according to researchers.But over time, Iapetus tore it apart and its bits slammed into the moon alongits equator, forming a ridgemore than twice as tall as Mount Everest. "Imagine all of these particles coming down horizontallyacross the equatorial surface at about 400 meters per second, the speed of arifle bullet," study co-author William McKinnon of Washington Universityin St. Louis said in a statement. "Particles would impact one by one, overand over again on the equatorial line. At first the debris would have madeholes to form a groove that eventually filled up." "It's one of the most astounding features in the solarsystem," said lead author Andrew Dombard of the University ofIllinois-Chicago, who presented the results today (Dec. 15) here at the fallmeeting of the American Geophysical Union. "It kind of gives Iapetus theappearance of a giant space walnut." Other researchers have proposed that volcanism or mountain-buildingforces inside Iapetus raised the ridge. But Dombard said such theories can'taccount for the ridge's near-perfect alignment along Iapetus' equator, or whythe moon is the only body in the solar system with such a feature. So Dombard and his team looked beyond Iapetus ? Saturn'sthird-largest moon, with a diameter of 913 miles (1,470 km) ? for anexplanation. "If it didn't come from below, maybe it came fromabove," he said. Dombard and his colleagues propose that the ridge is made ofthe shards of a sub-moon that once orbited Iapetus. This sub-moon, they said, could have been created when agiant body plowed into Iapetus long ago, blasting off material that eventually fusedand was captured by the moon's gravity. Such violentcollisions likely formed Earth's own moon and Charon, Pluto's largestsatellite. The researchers think Iapetus' sub-satellite then spiraled towardthe moon, eventually coming so close that Iapetus' gravity tore it apart. This lost mini-moon's bits would have formed a debris ringaround Iapetus' equator, the researchers added. Over time ? anywhere between100,000 years and 1 billion years, depending on how close the sub-mooninitially was to Iapetus? this ring slammed into the moon, creating its distinctive ridge. This theory can explain the ridge's location along Iapetus'equator, as well as why no similar feature is seen on any other solar systembody, Dombard said. 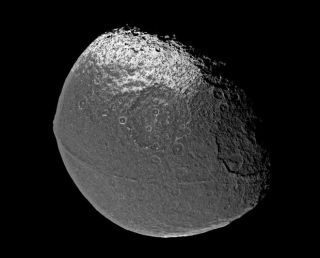 Iapetus has a far bigger Hill sphere ? the zone around acelestial body where its gravity dominates satellites ? than any other moon inthe outer solar system, he said. So on other moons, the parent planet would've snatched sucha sub-moon away relatively quickly. "Only Iapetus has the orbital space around it to holdonto one of these satellites," Dombard said. The researchers haven't yet performed any rigoroussimulations to show in detail how the ridge-formation process may haveproceeded, he added, but they plan to do so soon.